We woke up to a chilly morning at the lake, and our cold granola seemed particularly cold. Good thing we were headed towards hot food again! 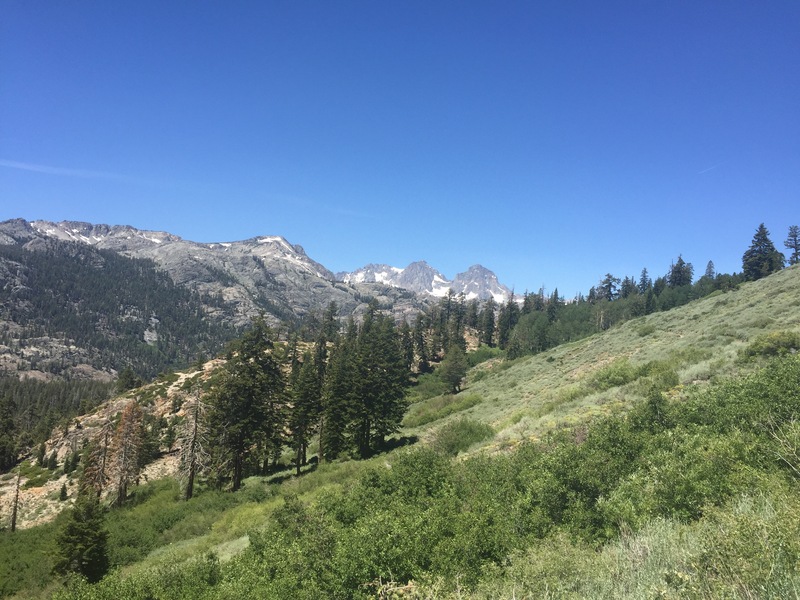 Red’s Meadow Pack Station & Resort is just a third of a mile off of the PCT, and a popular place for hikers to stop. We had a nice easy hike in, and arrived in time for lunch (patty melt, hot dog, and a malted shake for Garrett, a garden burger and root beer float for me!). Afterwards, we sat outside at the picnic table, and drank a few beers with fellow hikers. It was a great way to pass an afternoon. We had dinner too, then hiked out just before dark a little ways before setting up camp. The next day we hiked through Devil’s Postpile National Monument, and enjoyed a nice hike through the forest along a fork of the San Joaquin river. 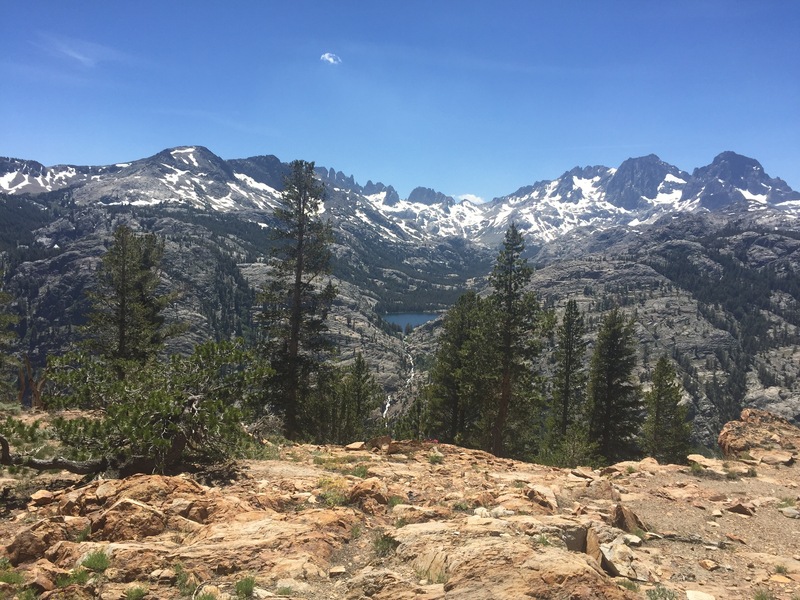 We crossed into the Ansel Adams Wilderness, and as you can expect, it was quite picturesque. That evening we found a great camp spot by a waterfall, and decided to stop hiking a bit earlier than usual to enjoy the scenery and the sound of rushing water. Day 60 we walked up towards Donahue Pass, past 1000 Island Lake. 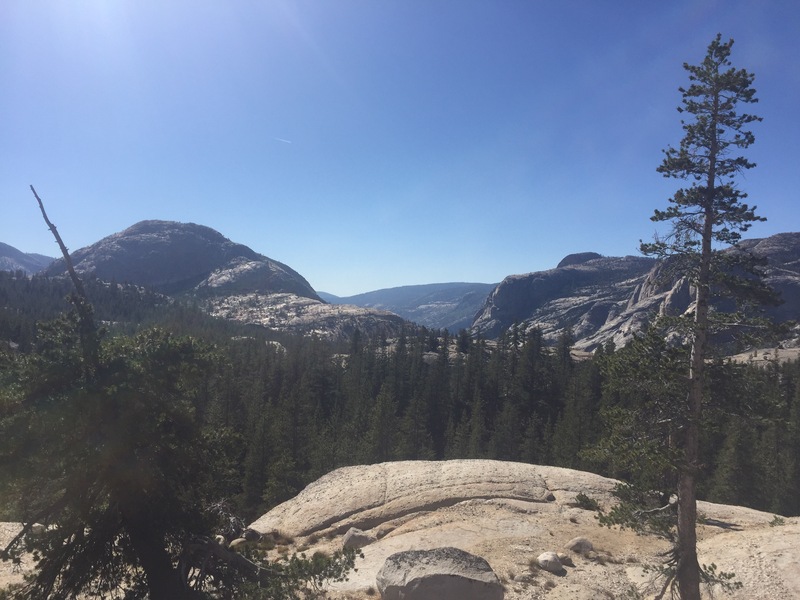 It was a relatively quick hike up to the pass, and at the top we entered the wilderness of Yosemite National Park. 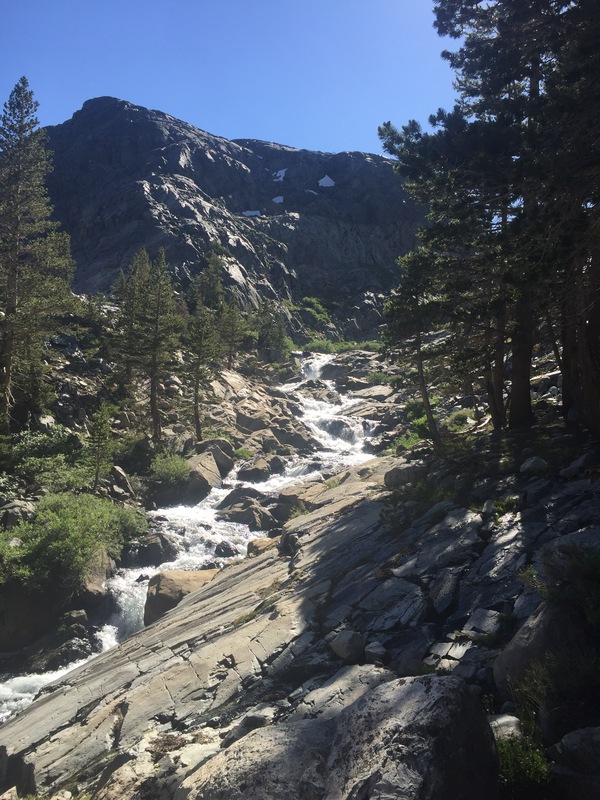 On the way down Garrett enjoyed a swim in a lake, and then we continued down into the beginning of Tuolumne Meadow. 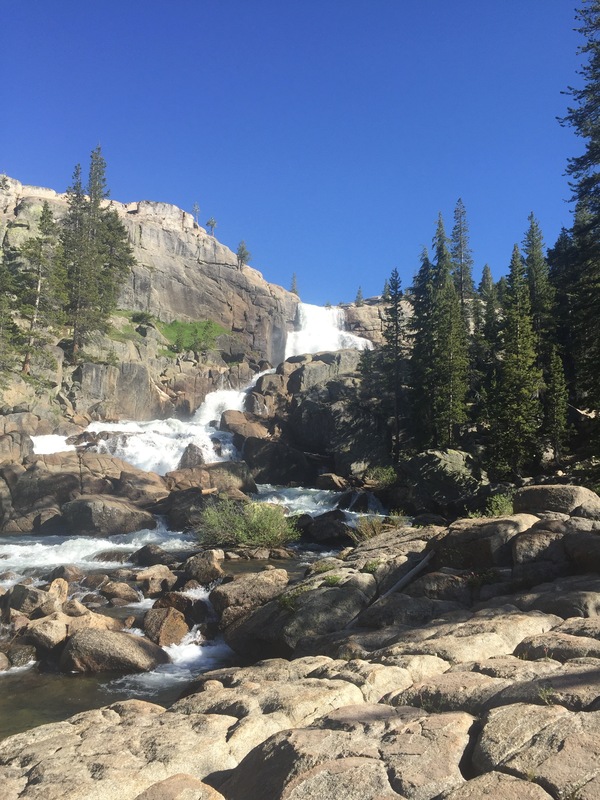 We camped under a tree by the Tuolumne River, and I went for a quick swim before dinner. 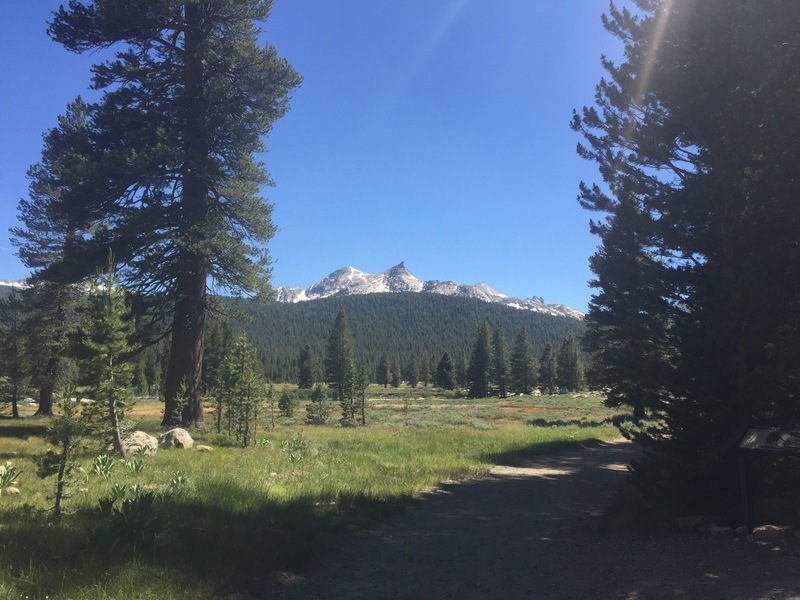 The next day we hiked out of the Yosemite wilderness, and into the part of Toulumne Meadows that visitors can drive to. We had a resupply package waiting for us at the post office there, and were looking forward to stopping at the general store and restaurant next door. When we arrived at 9am, trail angel Legend was in the parking lot making PCT hikers pancakes. We’ve run into him three times prior, although never in time for the”pancake festival.” He hiked the trail some years back, and now travels north along with the hiker wave in his RV & truck performing trail magic for hikers. We collected our boxes, and sat down to breakfast. We opened a care package from our good friend Diane, and were excited to find a can of funfetti frosting, Nutella & pretzels, and Jolly Ranchers. We quickly added the frosting to our pancake stacks, with syrup, and had a wonderful sugar-laden breakfast. We shared our frosting with other hikers and Legend, and we all agreed that frosting on pancakes is a good thing. We spent the rest of the morning sorting through our food, and chatting with other hikers. We grabbed lunch at the restaurant, chatted some more, then hiked back out into the woods. We had an awesome afternoon hiking over granite and past rushing streams, and admired Toulumne Falls. We made it to Glen Aulin backpacker camp, had dinner, and crawled into the tent before the mosquitos got too bad! I’ve read every one of your posts (I look forward to them) but this post by far is my favorite. The photos are spectacular! Keep hiking and keeping writing! Thanks, Jennifer! We will be sure to do both! A garden burger and root beer float could lure me anywhere! The falls look very beautiful — very impressive.